Cats can seem to be cold and uncaring at times, but even they swell with pride and joy when they give birth to adorable kittens. These photos will show you that pride, love and motherhood go hand-in in the cat world as well! Do you have any photos of happy cat families with their little kittens? Please add them to this list – the Internet could ALWAYS use more cats! While you're at it, check out this post of proud dog mommies, too! The milk bar is open, kids! Can you tell them apart? No, can you? They look like miniature versions of my cat! Looks like more kittens will be on their way soon. And what a gorgeous cat that is! Black ' sheep' of the family!! The size of those ears, so sweet. Oh my! Guess she felt safer being next to you when it happens! oh i love this colored cats so much! not in front of the kids!!! #35 She Adopted These Balls Of Fur, And Even Had Milk After Only 24 Hours! The moma is like, "You come any closer and I will rip your face off." Poor loves. Any chance of getting them to a rescue? #48 Stray Mommy Minnie Was Pregnant When We Found Her. 2 Kids Stayed Here, 4 Went Home In Pairs. Are they on the roof? #59 Myanmar Mamma Cat And Her Big Family. Mom is the ginger at the back. #62 Tortieco And Her 4 Babies. #63 Myanmar. 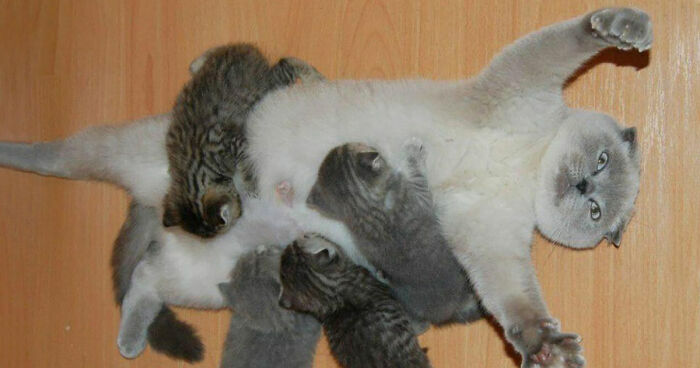 Mammacat Keeps All Het Kittens At Home. #65 My Cat Sugar Relaxing With Her Babies! #74 Piep With Her Beloved Ones! I love her name, too! #79 Mom Needs Some Time Alone But Kittens Aren't Fully Charges Yet. Myanmar Jumping Cat Monastery.